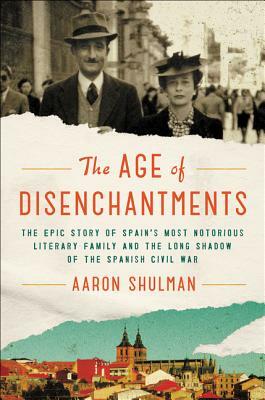 In this absorbing and atmospheric historical narrative, journalist Aaron Shulman takes us deeply into the circumstances surrounding the Spanish Civil War through the lives, loves, and poetry of the Paneros, Spain’s most compelling and eccentric family, whose lives intersected memorably with many of the most storied figures in the art, literature, and politics of the time—from Neruda to Salvador Dalí, from Ava Gardner to Pablo Picasso to Roberto Bolaño. Weaving memoir with cultural history and biography, and brought together with vivid storytelling and striking images, The Age of Disenchantments sheds new light on the romance and intellectual ferment of the era while revealing the profound and enduring devastation of the war, the Franco dictatorship, and the country’s transition to democracy. A searing tale of love and hatred, art and ambition, and freedom and oppression, The Age of Disenchantments is a chronicle of a family who modeled their lives (and deaths) on the works of art that most inspired and obsessed them and who, in turn, profoundly affected the culture and society around them. Aaron Shulman is a journalist whose work has appeared in publications including The Believer, The American Scholar, The New Republic, and The Los Angeles Review of Books. A collaborative writer and editorial coach, he works with visionary scientists and thinkers to bring their research to a wide readership. Shulman first lived in Spain while studying abroad and moved back in 2010 after falling in love with a Spanish woman. There, he published pieces about Spanish culture, social movements, and the economic crisis. In 2012, he watched “El Desencanto,” the 1976 documentary about the Panero family, and from that night onward became hopelessly obsessed. He now lives in Santa Barbara, California.